1 of 5 Heat broiler to high. Set oven rack about 8 inches from heat source. Coat a broiler pan with nonstick cooking spray. 2 of 5 Slice each chicken breast in half horizontally, leaving one side attached. Open like a book and season with 1/4 tsp of the salt and 1/8 tsp of the pepper. On one side of each breast, layer mozzarella, tomato and basil. Fold over. 3 of 5 Combine bread crumbs and Parmesan on a plate. 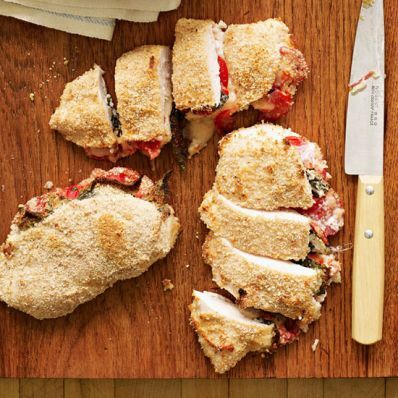 Dip both sides of chicken in egg whites and coat with bread crumb mixture; place on prepared broiler pan. Lightly spritz with nonstick cooking spray and broil for 4 to 5 minutes per side or until temperature reaches 160 degrees . 4 of 5 Meanwhile, in a medium saucepan heat oil over medium-high heat; add garlic and cook 30 seconds. Stir in tomatoes and remaining 1/4 tsp salt and 1/8 tsp pepper. Simmer 3 minutes; add basil. 5 of 5 Serve chicken with cooked angel hair and sauce.